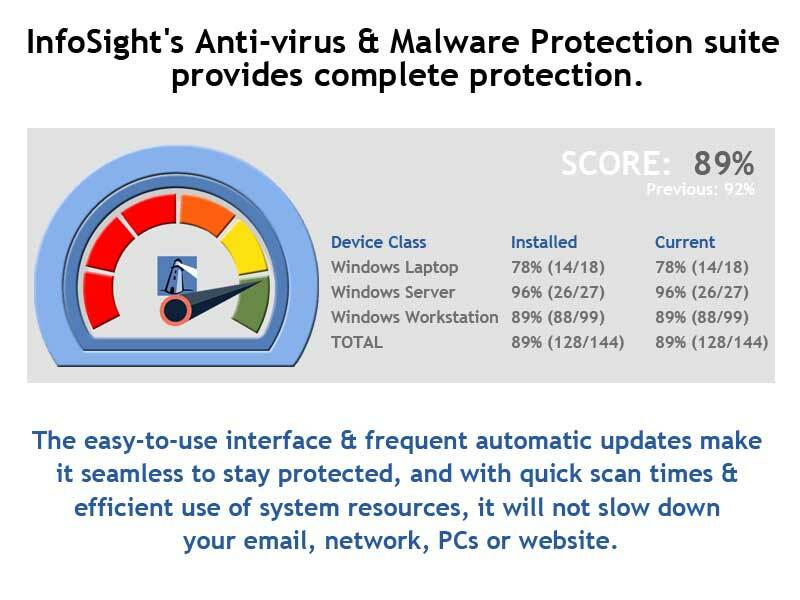 InfoSight's Endpoint Security Service provides complete protection against malware before any damage is done. In addition, it also provides defense against SPAM, Spyware and Ad-ware. The easy-to-use interface and frequent automatic updates make staying protected seamless, and with quick scan times and efficient use of system resources, it will not slow down your email, network, PCs or website. Web protection (optional) provides enhanced protection against web threats. Live URL filtering, which blocks access to websites that are known to host malware. Content scanning, which scans data and files downloaded from the internet (or intranet) and proactively detects malicious content. With Website control (optional), you can filter the web activity of users, based on the 14 website categories: Adult Sexually Explicit, Alcohol and Tobacco, Anonymizer Proxies, Criminal Activity, Gambling, Hacking, Illegal Drugs, Intolerance and Hate, Phishing and Fraud, Spam URLs, Spyware, Tasteless and Offensive, Violence, and Weapons. Auto-deploy protection to new devices or re-deploy if an employee attempts to remove protection. Know that your customers are protected by monitoring endpoint status. Auto-generate graphical reports that you can deliver to your customer to show them how protected they are. Viruses, worms, Trojans, spyware, adware, crimeware, rootkits, and other malicious software are designed to compromise systems and steal confidential personal and business data by cyber criminals worldwide. Organizations often struggle to defend against the constantly-evolving malware applications that are becoming greater in number, harder to detect and remove. In many cases, organizations don't even discover their systems and/or websites are infected with malware until long after they have been compromised. Only the most sophisticated malware defense techniques can detect and remove these malicious programs.